MarkMail is a great tool for searching mail archives. Although focussing on software development projects, they are open to requests, so last week I asked if they could index TAXACOM. My pitch was that TAXACOM is a long running list full of interesting conversations, has been the subject of scholarly study (Christine Hine's book I mentioned earlier), and is topical given interest in biodiversity and the Encyclopedia of Life. A broader theme might be databases, or the taxonomic impediment. 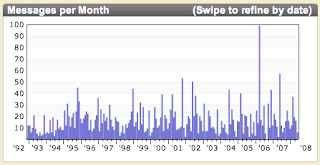 Below is the chart of messages over time for the query "databases". You can "swipe" the mouse across the chart to select messages from a given time span. I worry that I may end up spending more time playing with this than I should, but it's a neat tool. Hats off to Jason Hunter of MarkMail for adding TAXACOM so promptly.